The Reliable Answer for Any Water Leak Repair Need! 24-hour Emergency Service - Fix Leaks Fast! We handle any Everett -area plumbing problem that arises: Tubs, toilets, repipes, disposers, water pressure & more! Plumbing Experts NW can clear any clog in Everett, whether it's in your kitchen sink drain, your toilet, or in your side sewer line. Sewer lines can be tricky to diagnose and clear out. If you need it, we know sewer repair in Everett and can that as well. Water leaks are as frustrating as they are damaging. Whether the leak is somewhere in the home or underground in your main water line, the first problem is that they are difficult to locate. Secondly, you're going to want the problem fixed quickly, so there isn't much time to spare. Plumbing Experts NW has been an excellent answer for water leaks Everett folks deal with every day. Our company is set up to get a plumber out to you and working to find and fix your leak as quickly as possible. Many times, when there is a leak showing in the house, there is some water damage on a wall or ceiling or even water pooling somewhere. In most cases, the first step will be to turn off your water. 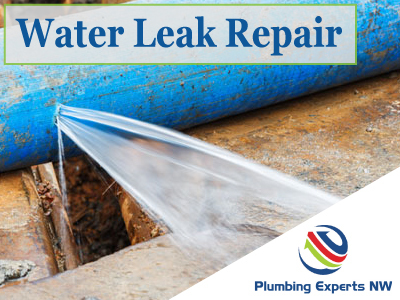 We know this and we are very quick to get a plumber on site and to diagnose exactly where the leak is coming from and what might have caused your water leak. Sometimes the issue is more isolated and requires a pipe or fitting to be addressed on its own, and other times we may find that overall corrosion of the home's pipes will require a bigger answer. Whatever you may need, our experienced techs will explain your options fully and begin work immediately.